This is a reprint of a text originally published by The Limited Editions Club in 1932, now with an introduction by Bruce Kennett. Dwiggins’ essay on the shortcomings of American paper currency and stamp design has long been one of my favorite texts of his. Seeing it back in print and available to a new, though not particularly wide, audience should excite me. But it hasn’t. My response is partly due to the book’s own shortcomings and partly due to my own relationship to the text and to Dwiggins. In the fall of 2013 I made what has become an annual pilgrimage to Boston to give a lecture and demonstration on the history of Western letterforms at MassArt and to continue my Dwiggins research. I stayed part of the time with Michael Russem of the Kat Ran Press. Michael, a stamp collector as well as a designer, told me that, as part of his continuing series of small books on the intersection of graphic design and philately, he was planning a reprint of Towards a Reform of the Paper Currency by Dwiggins. I was immediately excited by the announcement and asked him if I could write an essay to go with it. Unfortunately, he said he had already commissioned one, but wouldn’t divulge the name of the author. Rather than argue that I could do a better job than whoever he had chosen, I decided to just wait and see how the book turned out. Despite my attempts to be objective about the Kat Ran Press reprint of Reform in the review that follows, I am sure that it is colored by my disappointment at not being involved in it. In order to properly assess the Kat Ran Press edition of Reform, it is necessary to describe the original publication issued by The Limited Editions Club, an oddity in its history. The LEC book is 7.5 x 10.375 in size and hard bound with a slipcase. The binding is a patterned turquoise paper over boards with a handlettered pasted label and a black leather spine stamped in gold. The text—only 23 pages in length—is set in Monotype Baskerville. Headings are handlettered. Illustrations within the text—two finely-hatched mob scenes and seven line drawings—are in black and white while specimens of proposed currency and stamp designs at the back of the book, including a tipped-in 5 crown note, are in multiple colors. The book was printed on Zerkall paper by Peter Beilenson at the Walpole Printing Office in Mount Vernon, New York in an edition of 452 copies. Dwiggins was responsible not only for the text of Reform but for the typography, lettering, illustrations and binding design. In contrast, the Kat Ran Press edition, 40 pages in length, is a modest 5.875 x 9 inches in size with a softcover wrapper. The wrapper has a turquoise pattern designed by Cyrus Highsmith of Font Bureau, which appears in gray on the paper underneath. Highsmith’s typeface Quiosco has been used to set the text. The typography and design are by Michael Russem with the printing by Puritan Capital on an unspecified paper. 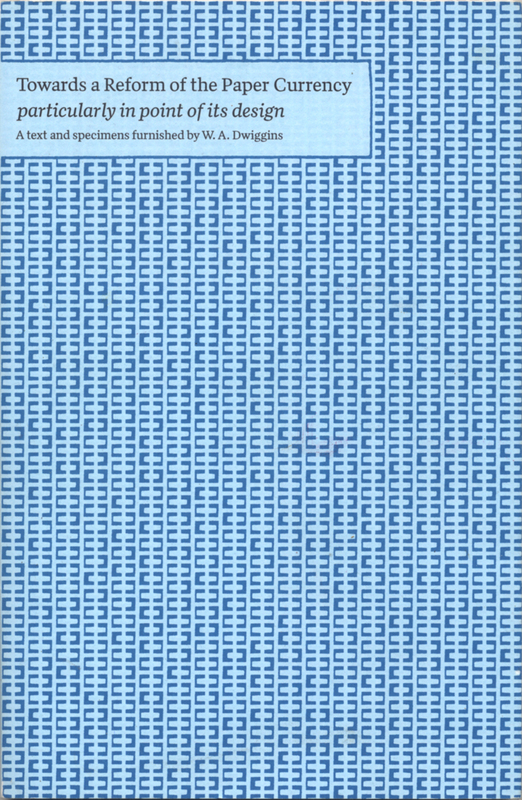 The edition, mimicking that of The Limited Editions Club, is 452 copies with one hundred slated for The Typophiles (as New Series Monograph no. 28), two hundred for David R. Godine, Publisher and the remainder for the Kat Ran Press. Forty copies have been hand-bound by Sarah Creighton. In my announcement of the Kat Ran Press edition of Reform, I chided Russem for offering hand-bound copies as a violation of Dwiggins’ views on book design—and as a sly reference to his own views on the excesses of contemporary fine press books—knowing full well that Kat Ran Press had to do that to satisfy the expectations of its customers. The same calculus was at work when The Limited Editions Club issued Dwiggins’ slender text with a hardcover binding and a slipcase. Dwiggins always liked books that fit comfortably in the hand and the Kat Ran Press Reform does just that. Its smaller size is less pretentious than the LEC edition. The change in size has led to a greater page count and thus a slightly bulkier, though still quite thin, book which gives the book greater strength in the absence of a hardcover binding. However, it has one unintended consequence: the seven line illustrations that Dwiggins inserted into the text have shifted and ended up in clumps. In the LEC edition figure 1—a comparison of borders—falls on p. 17 with figures 2 to 4—two comparisons of decorative ellipses and a detail of a decorated numeral 5—on the following spread. Figure 5—a solid version of the numeral 5 from the previous illustration minus the decoration lined up with seven numeral 5s from contemporary typefaces—is on p. 20 across from fig. 6, a comparison of a fat numeral 5 and a slender numeral 5, each supporting a similarly proportioned female. And figure 7—a comparison of a fat face letterform accompanied by an overweight thug with a classical roman letterform accompanied by a svelte runner—is on p. 22. Illustrations 1, 2 and 4 are roughly at the same height on the page as are illustrations 3, 5, 6 and 7 so that there is a sense of visual alignment as one turns the pages. Towards a Reform of the Paper Currency… by W.A. Dwiggins (Limited Editions Club, 1932), pp. 20–21. This rhythm is missing in the Kat Ran Press edition where the figures have been renumbered from 2 to 8—for reasons which will be explained later. Figures 2 to 4 appear on a spread (pp. 30–31) with figures 5, 6 and 7 ganged on the following page and figure 8 across from them. Grouping figures 5, 6 and 7 which all concern the design of the numeral 5 in one place may have made sense conceptually, but visually they feel crowded, especially since figure 5 is now on the same line with figure 6. 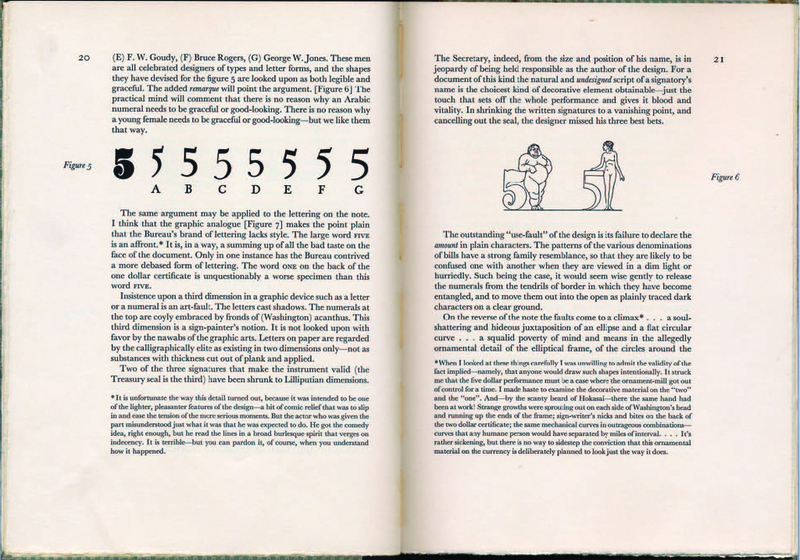 Figure 8 on the opposite page has been rearranged from Dwiggins’ original design. Both men now face right instead of left, the thug at the left side of the chunky “DOLLARS,” the runner at the right of the graceful “DOLLARS,” and the two lines no longer aligned vertically. The spread feels awkward; and the pace of the entire text seems more hurried. Towards a Reform of the Currency… by W.A. Dwiggins (Kat Ran Press, 2014), pp. 32–33. Russem has renumbered Dwiggins’ figures because he has added some illustrations to the reprint. The new figure 1 is a photograph (in full color, but at 155% of real size for legal reasons) of the front and back of a United States 1928 series five dollar bill. It is placed in the text as a double page fold-out between pages 28 and 29. 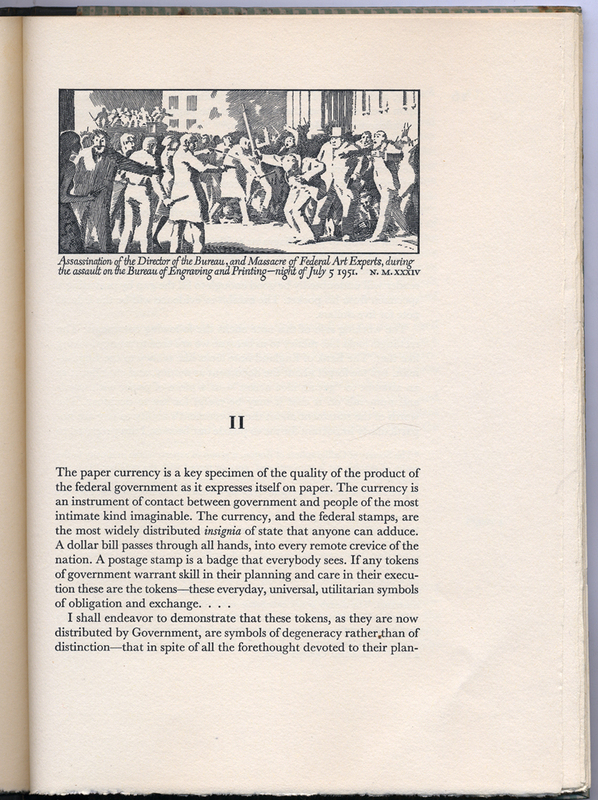 There are two other double page fold-outs in the book: one at the beginning of Dwiggins’ text that includes reproductions of his currency, postage stamp, tobacco revenue stamp, and postal cancellation designs for the fictitious country of the Antipodes; and another between pages 32 and 33 that reproduces (as figure 9) the front and back of the United States 1928 series one dollar bill (again in full color and at 155% of actual size). In addition to the photographs of American currency, Russem has included—though not in a fold-out—a photographic showing as figures 10 and 11 of American and German postage stamps (in full color and at actual size, with their denominations cancelled for legal reasons) from the years 1924 to 1932. Russem’s idea to include of American currency and American and German postage stamps from the period when Dwiggins was preparing Reform of the Paper Currency is brilliant. It is the the best thing about the Kat Ran Press edition. But the use of fold-outs is questionable. At first the fold-outs, especially the two with the American dollar bills, are a delightful surprise—as fold-outs usually are—but they are not marked and looking for them again is a chore. (The only clue to their presence is the thicker foredge of some pages.) More importantly, the act of unfolding and refolding the pages is disruptive. 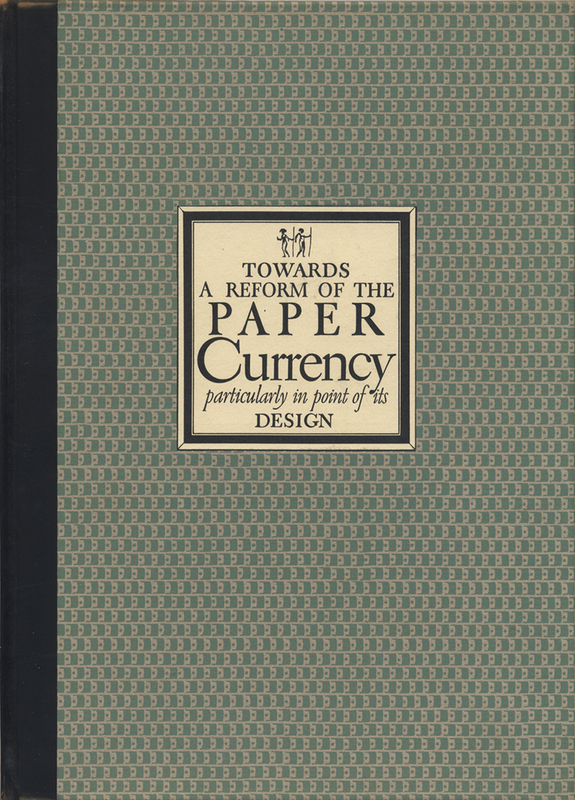 It gets in the way of reading what Dwiggins has to say about the design of the paper currency. This complaint does not apply to the first fold-out which contains Dwiggins’ Antipodes designs since it is placed at the beginning of his text, but it too is questionable on other grounds. One is that it is not it is easy to overlook, even though Russem has reproduced Dwiggins’ design for a postal cancellation opposite the opening of the text. The other is that if it is noticed, it completely ruins the pacing and surprise that Dwiggins built into his design of the original LEC edition of Reform. There, his Antipodean designs were relegated to the back of the book, following his excoriation and evisceration of the American currency and stamp design of his day. This was not only a practical printing solution for including color in the book, but was a means to heighten the anticipation of the reader, whether in agreement with Dwiggins’ opinions or skeptical of them. The reader of the LEC edition is eager to see what Dwiggins would do, but has to wait until the end to find out. With the Kat Ran Press edition, Dwiggins’ solution comes before he has set forth the problem. In the LEC edition of Reform Dwiggins positioned the long tobacco revenue stamp vertically on the page, forcing a reader’s head to swivel to fully take in the design. It is possible that this design determined the dimensions of the book. Similarly, I suspect that Russem wanted to show that long tobacco revenue stamp horizontally and that to do so, without running it over a gutter, gave him the idea of using fold-outs in the book. In that regard, the first fold-out makes a lot of sense. Towards a Reform of the Paper Currency… by W.A. Dwiggins (Kat Ran Press, 2014), foldout showing front of one dollar bill. The reverse is behind p. 33. The fold-outs for the American currency also make sense in that they bracket that portion of Dwiggins’ text where he illustrates his views on good and bad ornament and lettering. By being hidden the reproductions of the five dollar bill and one dollar bill are adjacent to those illustrations, yet do not compete with them. However, I think there are other (and better) solutions for integrating both the American money and the American and German stamps into Dwiggins’ essay. One that quickly comes to mind would have been to place the contemporary dollar bills and stamps up front as a prelude to the text of Reform where they would have provided an immediate context for Dwiggins’ comments. There would have been no need for foldouts since none of the items is awkwardly shaped like the long tobacco revenue stamp for the Antipodes. Or, to keep them close to Dwiggins’ examination of American currency, the dollar bills could have been placed on single-page foldouts near his illustrations with an indication in the margin for the reader to open up the page. Russem has already done this with the contemporary American and German stamps which appear on p. 37 following Dwiggins’ comments on pp. 35–36 of their relative merits. In the LEC edition of Reform the Antipodes 5 crown bill is tipped in. This is a luxury which Russem couldn’t afford for the reprint so the bill is shown, front and back, as the opening illustrations in the initial fold-out. 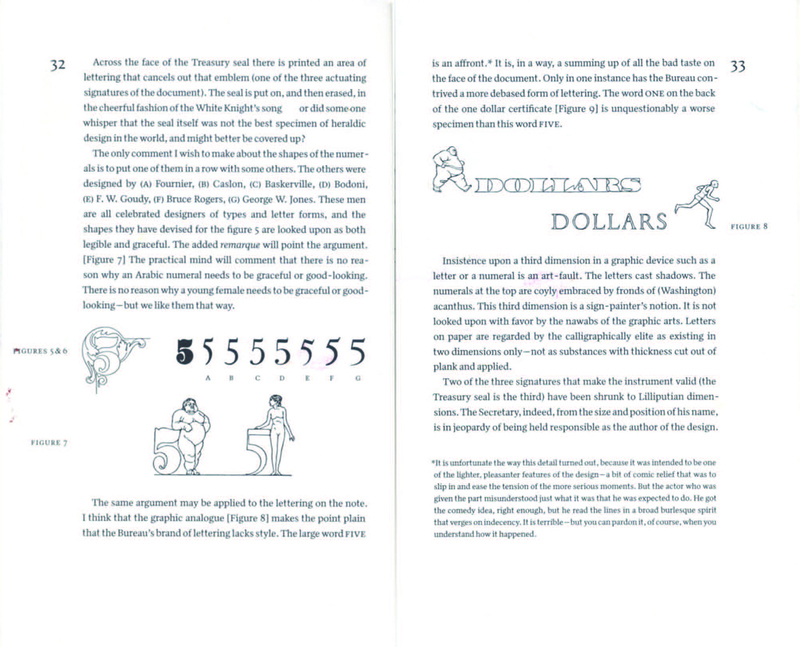 Although the illustrations in the Antipodes fold-out follow the sequence of the original color section of Reform with the currency preceding the postage and revenue stamps, the drama Dwiggins built in to the LEC edition has been lost. There are two other obvious changes Russem has made from the LEC edition of Reform, one that is understandable and one that strikes me as peculiar. He has dispensed with Dwiggins’ lovely title page just as he did with the original label. This makes perfect sense since the Kat Ran Press edition is a different size and makes no pretense to being a facsimile of the original. However, the decision to place the Dwiggins’s two illustrations chronicling future (July 5–6, 1951) events involving the Bureau of Engraving and Printing—preceded by a note indicating that “the events did not come to pass”—at the back of the book is a mistake. The illustrations feel marooned. Dwiggins placed the two “predictive” illustrations at the beginning of each of the two sections of his essay: “Infuriated Artists demolishing the Bureau of Engraving and Printing at Washington…” before his introductory remarks on how the state of American currency came to be as it is; and “Assassination of the Director of the Bureau, and Massacre of Federal Art Experts…” before his detailed analysis of the five dollar bill. Structurally, the two illustrations—drawn to mimic copperplate engravings—are crucial to the organization of the book itself. They serve as visual cues to the two halves of Dwiggins’ discussion. In the Kat Ran Press edition of Reform the two sections begin as traditional chapters—Russem has dispensed with the roman numerals Dwiggins used to mark each—with the text sunk on the page and a modest stick-up initial. The effect on the reader is quieter—and quicker—than Dwiggins’ way. And, of course, the shock of the illustrations, for those readers who stop and take in their captions, is gone. Only the humor is left in the Kat Ran Press version. At least the illustrations are reproduced at their original size so there is no loss of detail. 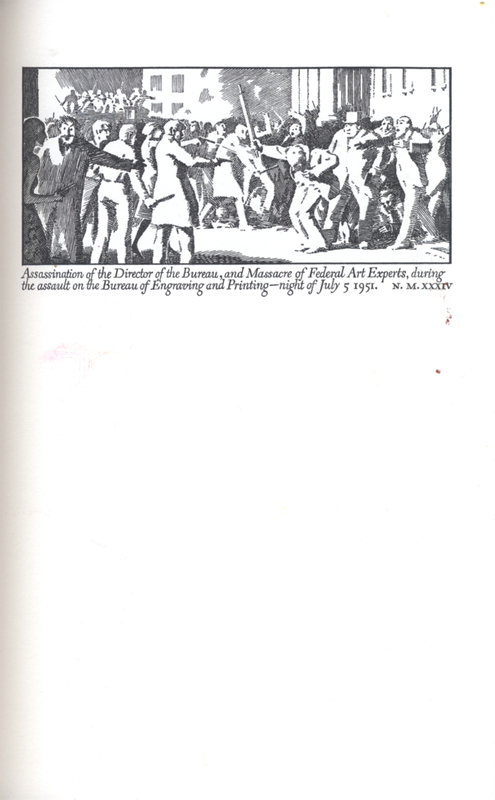 “Assassination of the Director of the Bureau, and Massacre of Federal Art Experts…” from Towards a Reform of the Paper Currency… (Kat Ran Press, 2014). Given the many changes that he made to Dwiggins’ original layout of Reform, it might have been a good idea for Russem to have included a designer’s note pointing them out and explaining his reasoning. He has proven himself to be a very thoughtful designer who does not do things arbitrarily or for aesthetic showmanship, so there may be valid reasons for the decisions he made that have not occurred to me. For Dwiggins the ideal paper is flexible, opaque and “natural” in color if white. He was against white paper that was too white or “india” in tone. The paper [80 lb. Mohawk Superfine, eggshell, white] used in the Kat Ran Press edition of Reform is properly flexible and opaque and, in the text pages, pleasantly warm. But for the “predictive” illustrations it is too bright—in comparison with the originals on Zerkall paper—making them look harsher than they are. Most likely Russem accepted this shortcoming as a trade-off that had to be made in order to guarantee that the colors of the Antipodes currency and stamp designs would be as crisp and accurate as possible, especially without the luxury of a tip-in on separate paper. The wrapper design of the Kat Ran Press edition of Reform echoes that of the original book, both in color and in pattern design, without being slavish. It also reminds me of the patterned paper wrappers—to be printed offset—that Dwiggins was experimenting with between 1948 and 1951 for Knopf. The design, by Cyrus Highsmith of the Font Bureau, seems to be made up of chunky typographic brackets of different weights. It has a pleasant liveliness without being aggressive. Highsmith’s Quiosco typeface (Font Bureau, 2006) is an inspired choice for the text of Reform. It is influenced by Dwiggins’ experiments with the “M-Formula,” an attempt to apply the idea of planar modeling facial features in marionettes to the design of a newspaper typeface (the unreleased Hingham). This concept is one Dwiggins’ most enduring legacies as indicated by the success of Quiosco as a text face. Russem has used the face well. The typography of Reform is impeccable, a pleasure to read. I have spent more time than planned on the physical and design aspects of the Kat Ran Press edition of Towards a Reform of the Paper Currency because Dwiggins was principally a designer of books, rather than a design writer. However, the acclaim accorded him as a book designer has tended to be superficial. It almost invariably has focused on his jackets, binding designs and decoration; and, on occasion, his illustrations. Rarely, has anyone discussed Dwiggins’ typography and layout, the heart of book design. While most of the books he designed for Knopf are only of interest for rising above the typography of books by other publishers of the time, those he designed for private presses and the Limited Editions Club reveal the work of a designer who challenged the conventions of Updike and Rogers while remaining true to the “crystal goblet” notion of a book as a conduit between author and reader. I have often thought about his typography and layout for books such as The Strange Case of Dr. Jekyll and Mr. Hyde (Random House, 1929), Edgar Allan Poe’s Tales (Lakeside Press, 1930), The Time Machine (Random House, 1931), Droll Stories (Limited Editions Club, 1932), The Travels of Marco Polo (The Printing House of Leo Hart, 1933) and Gargantua and Pantagruel (Limited Editions Club, 1936), but never for Towards a Reform of the Paper Currency. I have always taken its appearance, save the tipped-in five crown note, for granted. It was only in preparing this review that I began to realize its subtleties. When I set out to review the Kat Ran Press edition of Towards a Reform of the Paper Currency I expected to focus my attention on the elements that Russem had added: the illustrations of American currency from 1928, the American and German postage stamps from the period 1924 to 1932, and, especially, the introduction by Bruce Kennett. I was eager to read Kennett’s take on Dwiggins’ essay to see if he had any information on its complicated history that I didn’t already know and any new insights into its text. In both regards I am disappointed. Kennett’s introduction is predictable. It contains a one-paragraph outline of Dwiggins’ life and career, a summary of his illustration influences, a discussion of some of his writings on design prior to the publication of Towards a Reform of the Paper Currency, and a short account of the reaction that the book engendered. There is little new that one could not have learned from reading either of the Typophiles books devoted to Dwiggins: MSS by WAD (1947) and the two volumes of Postscripts on Dwiggins (1960). Kennett’s biographical profile of Dwiggins is capable, though he makes two mistakes regarding his art education in Chicago: Dwiggins attended the Frank Holme School from November 1899 to the early fall of 1901 (not 1903); and he studied lettering and ornament (not typography) from Frederic W. Goudy. Kennett rightly stresses Dwiggins’ versatility as an illustrator, yet says nothing about the diverse styles on display in Reform—from the line drawings of currency ornament to the pseudo-copperplate “predictive” illustrations to the mix of “colonial” and “deco” styles found in the fictitious Antipodean currency and stamp designs. Surprisingly, he makes no mention of Dwiggins’ lettering abilities either, even though the book is awash in examples of his flexibility and Dwiggins himself focuses in the text on lettering as a key component of good currency design. “Throughout the 1920s, Dwiggins contemplated the issues involved with the design of stamps and currency,” writes Kennett. He provides no evidence for this other than Dwiggins’ aborted attempt at a design for the Massachusetts Bay Colony Tercentenary stamp which took place “at the end of the decade.” His implication is that it was this stamp design assignment that provided the impetus for Dwiggins to write his essay on the need for currency reform. He is wrong. Newspaper editorials parroted the Treasury’s descriptions of the new bills and described them as “attractive in appearance.” It was this advertising campaign that most likely spurred Dwiggins to set down his thoughts on currency design. Given the closeness between the two men at the time, it may be that Hollister, a vice-president at Batten, Barton, Durstine & Osborn—to whom Layout in Advertising is dedicated—pushed Dwiggins to write Reform. In his essay, he urged the Treasury Department to hire someone to do the job right and he named Dwiggins among several candidates. The lack of information on the change in the American paper currency at the end of the 1920s in the Kat Ran Press edition of Reform is especially puzzling since Russem has included two examples of the new designs, the five dollar bill and the one dollar silver certificate. I don’t mean to dismiss Kennett’s discussion of Dwiggins’ design for the Tercentenary stamp as irrelevant to Reform, only to suggest that it was not the driving force behind the essay. The illustration of the rough design, and the winning stamp design at the back of the book among the American and German postage stamps, is a valuable aspect of the Kat Ran Press edition. Towards a Reform of the Paper Currency… by W.A. Dwiggins (Kat Ran Press, 2014). 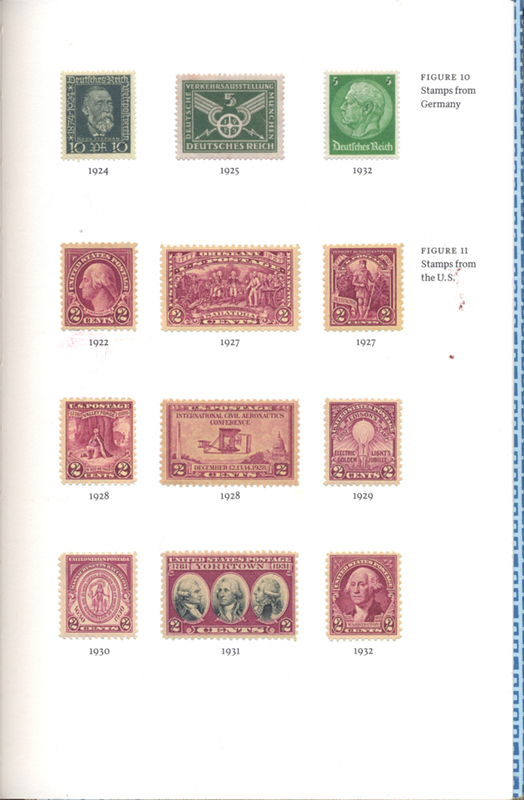 Sampling of German and American stamps from 1924 to 1932. “Casting about for help with the publication of this new project [Towards a Reform of the Paper Currency], Dwiggins appealed to George Macy of the Limited Editions Club (founded 1929) for whom Dwiggins was now designing books,” writes Kennett (p. 11). This is not true. The real history of how Dwiggins’ essay came to be published is much more convoluted than this. Dwiggins, who was in the midst of designing The Time Machine for Random House, initially asked Bennett Cerf to print it sometime in August 1930. Cerf was receptive but, quite rightly, wanted to see the H.G. Wells book completed first. The two men negotiated Reform for over a year before Cerf bowed out. At that point, Philip Hofer, at that time advisor to the Spencer Collection at the New York Public Library, who had been conniving since mid-1930 with Dwiggins to get the essay published, asked both Elmer Adler, publisher of The Colophon, and Macy if either was interested in issuing for their subscribers. Adler bit first and was ready to do it, with Macy’s acquiescence, until Dwiggins told Macy, “nothing doing on the Colophon lay. No go.”  Dwiggins wanted his text to stand alone and not be buried among other articles in The Colophon. Thus, in early October 1931 Dwiggins, Hofer and Macy all agreed that the text of Towards a Reform of the Paper Currency would become a special publication of The Limited Editions Club, to be sold to subscribers and outsiders at cost. It was this decision to sell Reform at cost that resulted in an edition of 452 copies, an odd number that Kat Ran Press deliberately matched with its reprint. LEC books were normally issued in editions of 1500 copies which suggests that fewer than one third of subscribers had any interest in what Dwiggins had to say about the design of American currency and stamps. Their ambivalence was reflected in the reactions to the book once it was issued in early 1932. The aftermath of the publication of Towards a Reform of the Paper Currency was more complicated than Kennett indicates. He write that the Treasury Department approached Dwiggins about the redesign of paper currency a decade later, actively seeking his advice. He writes, “During the fall of 1941 sketches for a new $5 bill flew back and forth between Hingham and Washington,” but that nothing came of the efforts as Dwiggins learned more about the process of producing currency and “saw that much of the design challenge had to do with machinery rather than anti-counterfeit measures.” (pp. 12–13) The project went nowhere. Kennett’s account comes from Dwiggins’ introduction to Early American Currency by George L. McKay (New York: The Typophiles, 1944). It is not the whole story. But Berdanier was back in July 1942 with another attempt at a group stamp design project, this time to commemorate the massacre and razing of the Czechoslovakian village of Lidice that had occurred the month before. The stamps were apparently commissioned by the Office of Facts and Figures, part of the Office of War Information, but when the project became public—and did not include the Post Office—it was scrapped by Postmaster General Frank C. Walker. At that point 62 designs from 20 artists had been received, including seven sketches from Dwiggins. One other aborted design by Dwiggins, a seal for the Office of War Information in August 1942, came about because of Towards a Reform of the Paper Currency. None of these efforts are touched upon by Kennett in his introduction to the Kat Ran Press edition. The sly allusions in Towards a Reform of the Paper Currency begin immediately with the dedication “To Mr. Verloc who dynamited the meridian of Greenwich”. Mr. Verloc is the central character in The Secret Agent by Joseph Conrad (1907), a novel about an anarchist plot to bomb the Greenwich Observatory in London as a symbolic “attack on science”. The dedication is tied to the two “predictive” illustrations about an attack on the Bureau of Engraving and Printing, the second of which is described as the “First phase of the Communist Revolution,” a phrase I believe refers not to the Bolshevik Revolution of 1917 in Russia, but to the revolutions of 1848. Dwiggins traced the design of American currency back to c.1845 and the “contemporary Style Louis-Philippe”, a reference to King Louis Philippe I (1773–1850) who was forced to abdicate during the French Revolution of 1848. Although Dwiggins deliberately dated his drawings of the fictitious attack on the Bureau of Engraving and Printing as “1951”, the attire of the individuals and the design of the lithographic press suggest that the activities took place in “1851”. “The seal is put on, and then erased, in the cheerful fashion of the White Knight’s song,” writes Dwiggins about the design of the five dollar bill. The reference is to Through the Looking Glass by Lewis Carroll (1871) and the White Knight’s constant change of the “name” of the song he is singing, though I am not sure the comparison is appropriate. This and the notes above are some of the references in Reform that I think Kennett should have noted in his introduction, even if a full explication was either beyond the intentions of Russem or the space available in the reprint. Obviously, my expectations for the Kat Ran Press reprint are clearly different from those of Kennett and Russem. The book they have produced is one that will appeal primarily to those already familiar with Dwiggins and his text, but who have either never seen the Limited Editions Club original or have been unable to acquire a copy of it due to its small print run. Yet, the equally small print run of the Kat Ran Press edition is unlikely to help spread Dwiggins’ design thinking much farther than this existing audience of Dwigginsophiles. This reprint of Towards a Reform of the Paper Currency Particularly in Point of Its Design is a worthy production. The inclusion of contemporary American currency and German and American postage stamps; and the reproduction of Dwiggins’ design for the Massachusetts Bay Colony Tercentenary stamp are wonderful additions to the original book. But this book could—and should—have been so much more than that. Towards a Reform of the Paper Currency Particularly in Point of Its Design by W.A. Dwiggins (New York: Limited Editions Club, 1932). Binding design (pattern and hand-lettered label) by Dwiggins. History of the Bureau of Engraving and Printing, 1862–1962 (Washington, DC: Treasury Department, 1964), p. 113. “An Irked Consumer Holds Forth on Our Legal Tender: Being a probably indictable dissertation on certain merits and demerits of the dollar” by Paul Hollister in The American Printer, vol. 90, no. 1 [January 1930], p. 45. Although Cerf and Random House turned down the chance to publish Towards a Reform of the Paper Currency, their proposed printer at the time, Peter Beilenson of The Walpole Printing Office, ended up printing the book for The Limited Editions Club. W.A. Dwiggins to George Macy, 3 October . University of Texas, Harry R. Ransom Humanities Research Center, George Macy Conpanies Collection, Box 100, Folder 10. George Macy to Philip Hofer 16 May 1932. Boston Public Library, Rare Books and Manuscripts, W.A. Dwiggins 2001 Collection, Box 12, Folder 1. See Boston Public Library, Rare Books and Manuscripts, W.A. Dwiggins 1974 Collection, Box 58, Folder 35 which contains all of the surviving correspondence on the 1941 United States currency project. Boston Public Library, Rare Books and Manuscripts, W.A. Dwiggins 1974 Collection, Box 58, Folders 24–29 and 35. The other designers that Berdanier rounded up were Warren Chappell, Paul Hollister, Clarence Hornung, Gustav Jensen, Sam Marsh, and Walter Dorwin Teague. The story of the Lidice stamp project being cancelled can be found in The Stamp Collector column by Richard McP. Cabeen in the 20 September 1942 Chicago Tribune, Part 6, p. 6. Dwiggins’ Lidice commemorative stamp sketches were reproduced in The American Artist (March 1943), p. 14. See W.A. Dwiggins to George Macy 16 January 1932. Dwiggins complained about the quality of the presswork of the prospectus for Towards a Reform of the Paper Currency, saying, “the whole burden of my story is in Peter B’s hands to make or mar. When you do as I have done—take a crack at something—you’ve got to be better than good in all the details of your slam.” Dwiggins didn’t want to “look like a jackass with yellow ears.” [Texas 2, Macy; George Macy Companies 2005, Box 100]. Peter B. was Peter Beilenson. Although Dwiggins describes the style of American currency as that of c.1845, the first national paper currency was not issued until 1861 and the United States Bureau of Engraving and Printing was not established until 1874. For more on the Antipodes as a mythical place in literature see Virtual Voyages: Travel Writing and the Antipodes 1605–1837 by Paul Longley Arthur (London and New York: Anthem Press, 2011); and for Thule see The Ice Museum: In Search of the Lost Land of Thule by Joanna Kavenna (New York: Viking Press, 2006). The signature of John Mandeville on the five crown note is a nod by Dwiggins to The Travels of Sir John Mandeville (c.1356), one of the earliest imaginary voyages.